Mike H. Echols lives in Tuscaloosa, AL, and was born December 22, 1951. He has one daughter Christy (LeFon), and is married to Amy Echols (nee Amy Celeste Holt of Montgomery, Alabama). Her son is Christopher Gattozzi. She serves on the Board of Directors for the Kentuck Art Association in Northport, AL, and is the Marketing Director at the Tuscaloosa accounting firm JamisonMoneyFarmer PC. 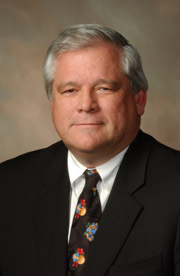 Mike studied at the University of Alabama from 1970-1974, and earned a Bachelor of Science degree in Accounting. And as a student, belonged to the Pi Kappa Phi fraternity. He owns Michael H Echols & Associates, PC, (aka Echols, Michael H & Associates P.C. and Echols Coogler and Associate PC CPA), is a member of the Alabama Society of CPAs and the American Institute of CPAs, and is associated with Project Delivery Systems, LLC; Northport Professional Properties, LLC and Victory Ink Company, Inc. Governor Robert Bentley’s long-time personal CPA and heavy hitting moneyman for the Robert Bentley Campaign Committee, has split from the governor. Echols, who handled the financial books and records for both the Bentleys and the Campaign Committee, resigned his post over a disagreement with Bentley about Rebekah Mason, the governor’s mistress and married paramour. The precise nature of this dispute, which occurred several weeks ago, is not known at this time. What is known, however, is that Bentley wanted Echols to do something questionable with the financial records relating to Rebekah Mason. The governor’s request did not sit well with Echols, a respected Tuscaloosa accountant and well-known PAC organizer. During a heated exchange between the two men, Echols refused the governor’s request and turned over the various checkbooks and financial records in his custody to Bentley. With this handover, the professional relationship between Echols and Bentley ended. Echols has been Bentley’s accountant for many years. He was also the Campaign Committee’s accountant in 2010 and 2014.